Etna (Sicily, Italy): The volcano is showing signs of becoming more active again: Over the past few weeks, emissions of gas, steam and sometimes perhaps some dilute ash from the main vent in the Voragine summit crater have increased. In addition, intermittent weak glow can be detected from the same vent at night. This, too seems to have been becoming stronger and more frequent recently. Bagana (Bougainville Island, Papua New Guinea): (10 Dec) Volcanic Ash Advisory Center Darwin (VAAC) issued the following report: VA OBS TO FL070 MOV TO NE AT 10/2230Z. Langila (New Britain, Papua New Guinea): (10 Dec) Volcanic Ash Advisory Center Darwin (VAAC) issued the following report: VA OBS TO FL080 EXT 25NM TO N AT 10/2050Z. Dukono (Halmahera): Volcanic Ash Advisory Center Darwin (VAAC) issued the following report: CONTINUOUS VA EMISSIONS TO FL100 EXT 165NM TO SE. Volcanic Ash Advisory Center Darwin (VAAC) issued the following report: CONTINUOUS VA EMISSIONS TO FL100 EXT TO ESE. Colima (Western Mexico): There are no significant changes, but it seems that the volcano has been a bit calmer during the past 24 hours. 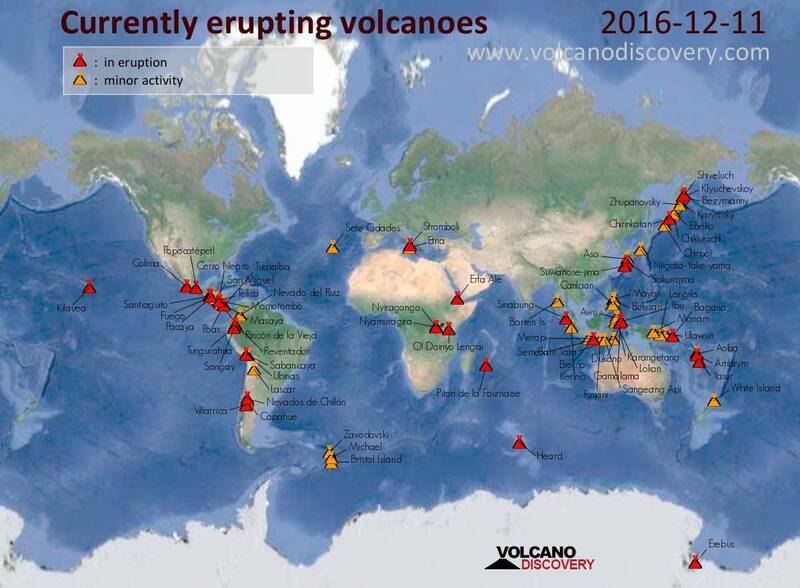 Small to moderate vulcanian explosions continue to occur, but their average frequency and strength seems to have diminished a bit. The lava flow on the southern slope is still active, although there is very little advance and less rockfalls than before, suggesting that it might be more or less cut off from its source at the dome or that the effusion rate has dropped for the moment. Volcanic Ash Advisory Center Washington (VAAC) issued the following report: VA EM AROUND 10/2315Z. Turrialba (Costa Rica): Volcanic Ash Advisory Center Washington (VAAC) issued the following report: VA EMS.